Livescape Asia, the organisers that brought you Future Music Festival Asia, It's The Ship and many other acts over the years, will now be bringing over Boyce Avenue, the popular America based YouTube musicians to Kuala Lumpur next year! Announced on Livescape Asia's Facebook page today, there is no date set for the show yet, but more details are set to be unveiled in January 2015. The band that's made up of three brothers, Alejandro Luis Manzano, Daniel Enrique Manzano and Fabian Rafael Manzano, got the quirky name of their band from the two streets they lived on when they were young. 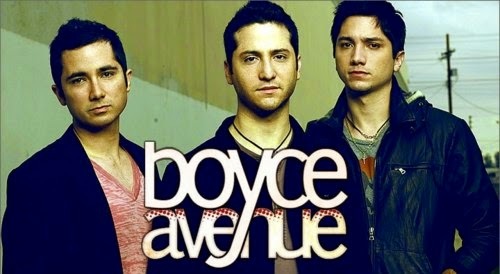 Boyce Avenue gained their 6.5 million strong subscribers on YouTube with their beautiful acoustic song covers over the years. The band also have a few original songs under their belt and having been touring in America, Europe and some parts of Asia as well, so it only makes sense that they're finally heading to Malaysia! Stay tuned to more updates on the Boyce Avenue show in January 2015!